Marseille is the second largest French city after the capital Paris. 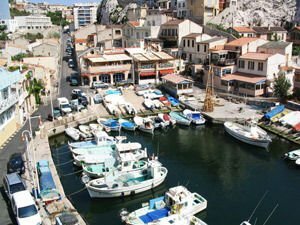 While it has a slightly dubious reputation and is not a very visited by tourists destination, Marseille has a long history and interesting sights. The city suffered hard times, but then gradually recovered, resulting in Marseille today as a modern city that offers great cultural diversity. Almost all architectural monuments in Marseille have been recovered. Marseille is easily accessible from the capital Paris, thanks to the fast train TGV. Marseille is located in south eastern France, and is the centre of the region Provence-Alpes-Côte d'Azur region and the Bouches-du-Rhône department. Marseille is the largest cargo port in the Mediterranean and in France, and it is the fourth largest port in the European Union. The history of Marseille began in the 7th century BC when it was founded by Greek traders from Fokea Minor- Asia. Marseille joined France in 1481. In 1792 the city sent 500 volunteers to Paris to support the French Revolution. These Marseille locals marched singing along the Rhine, a song became known as the Marseillaise. This is now the national anthem of France. 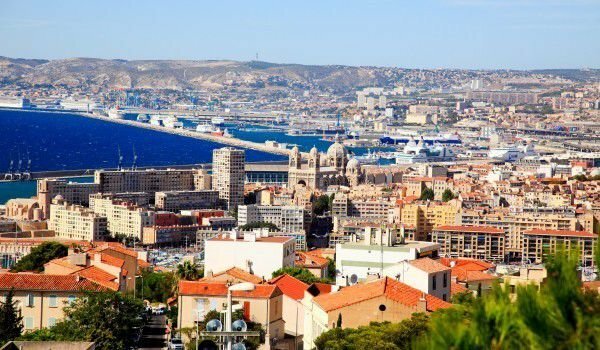 The importance of Marseille as a port grew in the 19th century, when the colonization of Africa was underway, with the opening of the Suez Canal and the flourishing industrial development. Old Town Marseille is the heart of this French village. It is located mainly around the old port of Marseilles and slightly north. Old Town Marseille is named Le Panier. "La Kanbier" extends north-east of the port and the surrounding neighbourhood is the colourful Maghreb. You can visit the large and noisy markets, known for their various oriental spices, Colourful African fabrics and beautiful fabrics and exotic plants. The entrance to the harbour is guarded by two beautiful Fortresses. The largest and most famous landmark Marseille is undoubtedly Notre-Dame-de-la-Garde, which rises high above the city. It is now the calling card of Marseille. On top of the temple is remarkable large statue of the Virgin and Child, which is lined with gold. The lining used 29, 400 gold plates. There is no place in Marseille, either on water or land where you could not see the magnificent statue. This Catholic church was built between 1853 and 1864, her architect is Esperandyo who designed and Cathedral de la Major. In the presence of 300, 000 people on 21 June 1931, on the statue of the Blessed Virgin, rising to the top of the cathedral was placed a crown. The statue of the Virgin Mary is high 9, 70 m and weighs 4500 kilograms. Front of the Basilica there are two statues. One is of the prophet Isaiah and the other on St. John. The bell of the basilica was consecrated in 1845 and was named Maria Josefina. It weighs 8234 kg. The bell is 5 meters tall, with only it’s tongue weighing 387 kg. The very old part of Marseille - Le Panier, is made up of narrow streets and interesting stone staircases. During World War II this part of Marseille suffered huge losses due to dynamite planted by the Nazis, whose purpose was to kill Jews and resistance fighters. In post-war years of excavations, Roman storage facility is found, which today has become a museum. In the highest part of Le Panier lies an interesting workshop from the 17th century. Its name is Opis de la Charité Viey, and today it is a restored building in a beautiful baroque style. This structure belongs to the chapel. It has beautiful pink stone arcades and regularly hosts different concerts and exhibitions. The building houses two museums.